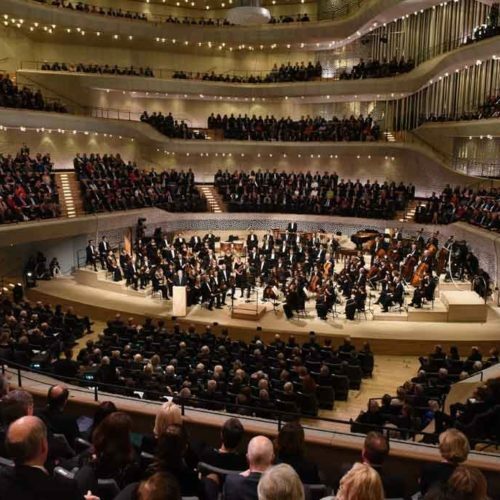 ‘The arguments are well-known and do not change the fact that in the Elbphilharmonie excellent concerts take place that leave no wish unfulfilled. A serious examination of the subject would indicate that the auditory impression on backstage venues in any hall in the world is compromised when a singer sings in front of a large orchestra. Why so many halls are built in this layout is worth considering. Remote diagnostics and reports which refer to the opening concerts about 800 concerts later are unfortunately just as irrelevant as the opinion of the experts Müller and Stephenson. Die Argumente sind altbekannt und ändern nichts an der Tatsache, dass in der Elbphilharmonie am laufenden Band ausgezeichnete Konzerte stattfinden, die akustisch keinen Wunsch offen lassen. Eine seriöse Auseinandersetzung mit dem Thema würde darauf hinweisen, dass der Höreindruck auf Plätzen hinter der Bühne in jedem Saal der Welt beeinträchtigt ist, wenn ein Sänger vor einem großem Orchester singt. Warum trotzdem so viele Säle in diesem Layout gebaut werden, wäre dann eine Betrachtung wert. Ferndiagnosen und Berichte, die sich rund 800 Konzerte später immer noch ausschließlich auf die Eröffnungskonzerte beziehen, sind leider ebenso wenig relevant wie die Meinung der Experten Müller und Stephenson, die sich seit zwölf Jahren an der Elbphilharmonie abarbeiten und sich für befangen erklären müssten. Where did I listen to this before? Also there are quite a couple of complex corridors and strange corners in the building. The German aunt of my PA went to a Mahler concert there and never came back. Where there other singers complaining about the hall or was it only Mr Kaufmann? As long as the music critics get the best seats in the house, as long as tourists / one-time visitors buy the worst seats in the house, there is no need to change. No one really cared that the Met was too big until it started failing to fill the house on a regular basis. Just a few days after Mr. Kaufmann, Erwin Schrott and his Ensemble were singing a formidable half-scene Don Giovanni, also with a big orchestra but without any complainings from the audience. Nobody has left the hall, nobody screamed, also the tenor didn’t have any big problems. Maybe it wasn’t the hall’s fault in Mr. Kaufmann’s concert? If “backstage” means behind the orchestra instead of its usual meaning, then yes. But if a significant proportion of the audience is behind the orchestra, as opposed to a couple of hundred when a choir is not required, that is a problem is it not? Solo singers pitted against a large orchestra always present a problem. I heard e.g. Das Lied von der Erde at the Cologne Philharmonic Hall some years ago (with Waltraud Meier and Thorsten Kerl). The hall has excellent sonics, but you could barely hear (much less: understand) the singers. They should use amplification for such complex works. Please, don’t even think about it. If the balance doesn’t work in a classical piece, this needs to be resolved on stage and nowhere else. Amplifying singers or instruments will almost always make things worse. The conductor should make sure the orchestra lets the singer be heard. That piece is very difficult in performance because of the writing. The conductor has to subdue the players but in the same time, keep the balance right and the fortes keeping their character of forte without really being forte, and that is really difficult for the players. Also realizing all the musical nuances between mf and ppp for a large group is hard. The same problem, only slightly less, with Strauss’ 4 last songs. Oh what fun we will have with the new concert halls at the Barbican and Wimbledon! Interesting read. Wasn’t it one of the „strongest“ arguments for a new hall in Hamburg that big size orchestra pieces are having to many limits in the old hall? And now it doesn’t work? Why? It seems that this is not connected with the architect but with the composers who used to drive their music in an old Merceds Benz. Something that doesn’t work with a modern Toyota. So actually, I was unable to orchestrate my works for the needs of this hot spot as well as my colleagues Strauss and Wagner. We failed completely and so I do apologise for that at least for my part. It seems I lost my award being one of the best orchestrators of the 20th century. Instead of promoting your new piece through this blog, you better go back to the finale of your nr 5 and 7, and weed-out lots of unnecessary notes and instruments in nr 8, and cut mvt 2, 3 & 4 from nr 9 which don’t add anything to the 1st mvt, and maybe you could finally finish nr 10 instead of letting dry musicologists tamper with your sketches. Maybe you are an unrecognised genius but I don’t recall that I ever heard any symphony from you so I cannot judge what needs to be erased in your works. For any judgment one has first to KNOW something. Merely recalling one’s own memory’s void does not show much confidence in one’s judgement faculties. Your commentary is a delight! I am smiling even now. very loudly. Well, I had the impression that I was not really there. Music Lovers, leave these seats, wherever, to the tourists , the post-modernly educated or perhaps a few brexiteers. Concert Halls are very complex things, and however hard architects try, the acoustic results can be very unpredictable. The Colston Hall in Bristol , quite well regarded in general, was absolutely hopeless ( 50 years ago when I went regularly – it may have changed since ) for piano music if you sat underneath the gallery . All you could hear was the rattle of hammers hitting strings, with no resonance of the strings being audible. How on earth can that come about ? As a rule I will never get a seat from which I cannot see the hall’s ceiling. Deep under a balcony you are essentially getting only the instruments’ direct sound and a tiny and directionally restricted sample of the hall’s reflection and reverb characteristics. In NYC this rules out many seats at Carnegie and the MET. Well, he is the Intendant of the place. What should we expect? Unfortunately he has no arguments for his place. Only fallacies.